Eyes and Vision, An Eye Doctor's View: What is Orthokeratology, or Ortho-K? 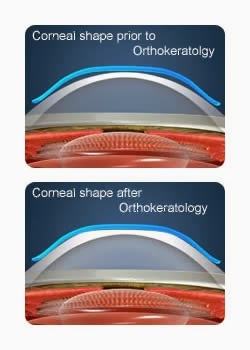 What is Orthokeratology, or Ortho-K? Orthokeratology is a treatment where a nearsighted, or myopic, patient places custom designed lenses in their eyes just before going to sleep. These special lenses gently mold the front surface of the cornea (the clear part of the eye that conventional contacts rest on) to correct the patient’s vision. The lenses are removed upon wakening, and contacts/glasses are then no longer needed during the daytime! No. This is a gentle molding of the cornea. Absolutely, under the care of a certified Orthokeratologist. Dr. Neukirch is a member of the Orthokeratology Academy of America (OAA) and will only use materials and designs that are FDA approved. The only manufacturer to receive FDA approval is Paragon CRT, thus these are the only lenses he prescribes. Dr. Neukirch is happy to speak with your doctor or pediatrician should they have any questions. Is this a new procedure? Not entirely. Ortho-K has been around since the 1960’s. Ortho-K has historically been very popular in Asian countries, where myopia was much more prevalent. Recent advancements in computerized instrumentation and lens design has yielded dramatically improved results. Can Ortho-K keep your eyes from getting worse? Myopia typically progresses until a patient reaches 20 to 25 years of age. If Ortho-K is initiated before that time, peer-reviewed clinical research indicates that the treatment may slow this progression; sources are found at the end of this article. Why am I only hearing about this now? Multiple reasons: 1.) The first and only FDA approved treatment was Paragon CRT in 2011. 2.) 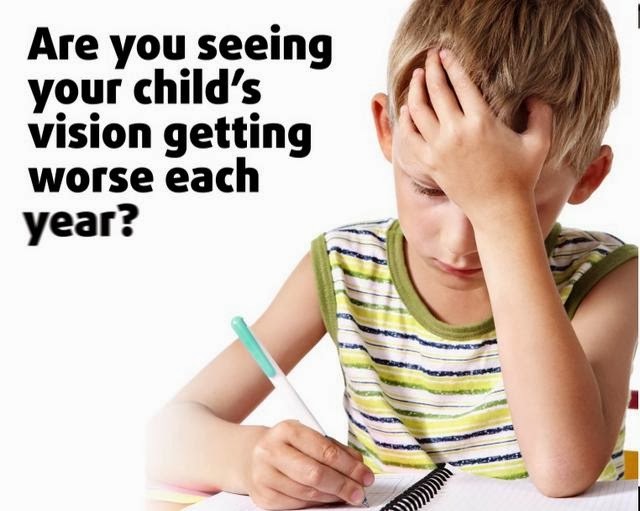 Myopia has become much more prevalent in the United States within the past twenty years. 3.) The clinical research which confirms the link between Ortho-K and delayed progression of myopia has only been published in the last couple of years (sources below). Has anyone at Carillon undergone Ortho-K? Yes. Our staff member, Anna (previously -2.00 in both eyes), started her treatment this past December, and has been glasses-free ever since. Please feel free to ask her about her personal experience! The best candidates for Ortho-K are myopic children and teenagers, whose eyes are still changing. However, adults (like Anna) can make great candidates, too. Unfortunately, certain prescriptions and corneal shapes may exclude patients from utilizing this treatment. Okay, I am interested! What’s my next step? Simply inquire at your next exam, or call our office. Our doctors can review your chart to see if Ortho-K is a possibility for you or your children. Ortho-K consultations are completely free of charge, if the patient has received a comprehensive eye exam at our office within the past year. In addition to the journal articles below, Paragon CRT has a great patient website at www.CRTvision.com. We also have pamphlets available at the Carillon front desk. Please feel free to email Dr. Neukirch directly at carillonvisioncare@gmail.com with any questions. Dr. Andrew Neukirch practices at Carillon Vision Care located in Glenview, Illinois. Myopia control in children through refractive therapy gas permeable contact lenses: is it for real? Koffler BH, Sears JJ. American Journal of Ophthalmology. December 2013. Myopia Control with Orthokeratology Contact Lenses in Spain: Refractive and Biometric Changes. Jacinto Santodomingo-Rubido, César Villa-Collar, Bernard Gilmartin and Ramón Gutiérrez-Ortega. Investigative Ophthalmology and Visual Science. July 2012. Trial. Pauline Cho and Sin-Wan Cheung. Investigative Ophthalmology and Visual Science. October 2012. That's great that one of your own staff members have gone through treatment and had such a positive experience. I'm also pleased that it's best for children and teenagers. We are considering having this done for our son, but we weren't sure. Thanks for the information! You were very helpful! Orthokeratology sounds almost like braces for your eyes. The concept is really interesting. This only works for nearsighted people though? That's a bit unfortunate because I am farsighted. I might consider getting laser surgery down the road though if my eyes can stay consistent. ortho k contact lenses is used to correct your vision while you sleep. When you remove your lenses in the morning, your corneas will retain their shape which will give you clear, comfortable vision.